A never ending stream of media propaganda promotes yet another “statin” drug to lower your “bad LDL cholesterol” that supposedly leads to heart attack, stroke, erectile dysfunction, etc. It is amazing to watch and listen to this deceptive and misleading information being transmitted to the masses. An estimated six billion dollars were spent on pharmaceutical drug TV ads last year. Why? Because the ads work by desensitization, in spite of the litany of side-effects (even death!) listed at the end of each ad. “Statin” drugs themselves are hepatotoxic and regular blood testing for elevated liver enzymes must be performed. “Statin” drugs are being promoted to reduce LDL cholesterol levels because elevated LDL cholesterol has statistically been associated with a higher rate of cardiovascular deaths. However, a statistical association does not prove “cause and effect”. It makes no more sense to say that the firemen found fighting a fire are, in fact, the cause of the fire. In weighing the advantages and disadvantages of the evidence-based detoxification products available, the mechanism of toxicant binding is of primary consideration. Although profound in application, the binding action of zeolite is simple to understand. The uptake of toxic heavy metals, chemical toxins or other free radicals in zeolites is called adsorption. Adsorption (not to be confused with absorption) is the accumulation of atoms or molecules on the surface of an adsorbent solid, such as zeolite. The driving force behind adsorption is the highly polar surface within the pores of the zeolite structure. This unique characteristic distinguishes zeolites enabling an extremely high adsorption capacity for water and other polar components even at very low concentrations. Advanced Cellular Zeolite (ACZ) nano crystals are characterized by a three-dimensional pore system, with pores of precisely defined diameter. Pores of precisely uniform openings within these nano, crystalline structures allow for molecules smaller than its pore diameter, such as Mercury, to be adsorbed while excluding larger molecules, such as Calcium and Potassium, hence the name “molecular sieve”. 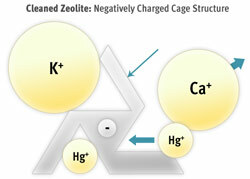 Depicted in the diagram, smaller Mercuric ions are pulled deeply into the nano zeolite cage structure and held securely for safe elimination, while Calcium and Potassium are “sieved”. The molecular selectivity series of ACZ nano Extra Strength is backed by atomic absorption spectroscopy studies. As you can see, toxic heavy metals are highest in preference of attraction. ACZ nano Extra Strength has powerful antioxidant properties. Its structure not only traps toxins such as toxic heavy metals, but also free radical molecules. However, unlike classic antioxidants, nano zeolite crystals do not neutralize free radicals by donating an electron to stabilize them. Instead, the structure of the zeolite is such that it captures the free radical and locks it safely away so that it cannot harm the body. Once trapped in the zeolite, the inactivated free radical can then safely be eliminated from the body. A safe and proven detoxification agent, ACZ nano Extra Strength selectively and irreversibly binds toxic substances, without binding or removing nutrient elements. ACZ nano Extra Strength safely removes Mercury, Lead, Aluminum, Antimony, Arsenic, Barium, Bismuth, Cadmium, Cesium, Gadolinium, Gallium, Nickel, Niobium, Platinum, Rubidium, Thallium, Thorium, Tin, Tungsten, Uranium and more. The following four patients had heavy metal urine challenge testing done and tested positive for a wide range of toxic heavy metals including Mercury, Lead, Aluminum, Arsenic and Tin. As their toxic heavy metal levels were reduced by ACZ nano Extra Strength, their lipid levels shifted to a more favorable profile in a surprisingly short amount of time. There was no toxicity or side effects. Compare these favorable results to the significant life threatening side effects caused by the use of “statin” pharmaceutical drugs. 1. Olson RE (February 1998). "Discovery of the lipoproteins, their role in fat transport and their significance as risk factors". J. Nutr. 128 (2 Suppl): 439S–443S. PMID 9478044. http://jn.nutrition.org/cgi/pmidlookup?view=long&pmid=9478044. 2. ^ Pawlina, Wojciech; Ross, Michael W. (2006). Histology: a text and atlas: with correlated cell and molecular biology. Philadelphia: Lippincott Wiliams & Wilkins. pp. 230. ISBN 0-7817-5056-3. 3. ^ Smith LL (1991). "Another cholesterol hypothesis: cholesterol as antioxidant". Free Radic. Biol. Med. 11 (1): 47–61. doi:10.1016/0891-5849(91)90187-8. PMID 1937129. 4. ^ Christie, William (2003). Lipid analysis: isolation, separation, identification, and structural analysis of lipids. Ayr, Scotland: Oily Press. ISBN 0-9531949-5-7. 6. Pelton, La Valle, et al. Drug-Induced Nutrient Depletion Handbook. Lexi-Comp Clinical Reference Library. 1999-2000. 7. Ghirlanda G, Oradei A, Manto A, Lippa S, Uccioli L, Caputo S, Greco AV, Littarru GP. Evidence of plasma CoQ10-lowering effect by HMG-CoA reductase inhibitors: a double-blind, placebo-controlled study. J Clin Pharmacol. 1993.Mar;33(3):226-229. 8. Watts GF, Castelluccio C, Rice-Evans C, Taub NA, Baum H, Quinn PJ. Plasma coenzyme Q (ubiquinone) concentrations in patients treated with simvastatin. J Clin Pathol. Nov 1993;46(11):1055-1057. 9. Bliznakov EG, Wilkins DJ. Biochemical and clinical consequences of inhibiting coenzyme Q10 biosynthesis by lipid-lowering HMG-CoA reductase inhibitors (Statins): a critical overview. Adv Ther. Jul/Aug 1998;15(4):218-228. 10. DiMauro S., Exercise intolerance and the mitochondrial respiratory chain. Ital J Neurol Sci. Dec 1999;20(6):387-393. 11. Artuch R, Colome C, Vilaseca MA, Pineda M, Campistol J. Ubiquinone: metabolism and functions, ubiquinone deficiency, and its implication in mitochondrial encephalopathies. Treatment with ubiquinone. Rev Neurol. Jul 1999;29(1):59-63. 13. Wollschlaeger, Bernd.J.Am.Nutraceutical Assoc. Statin Drugs and CoenzymeQ10: A Potential for Drug Induced Nutrient Deplention. May 2001.